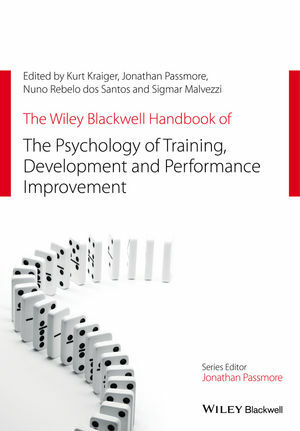 The latest Wiley Blackwell Handbook of Organizational Psychology uses a psychological perspective, and a uniquely global focus, to review the latest literature and research in the interconnected fields of training, development, and performance appraisal. Kurt Kraiger is Department Chair and Professor of Psychology at Colorado State University, USA. He is a Fellow and former President of the Society of Industrial/Organizational Psychology (SIOP), and is also a Fellow of the Association for Psychological Science. He is a noted expert on training and training evaluation, having published or presented over 140 papers on training and related topics. He is the editor of Creating, Implementing, and Managing Effective Training and Development: State-of-the-Art Lessons for Practice (Jossey-Bass, 2001) and the co-editor of Improving Training Effectiveness in Work Organizations (1997). He is currently on the editorial boards of the Journal of Applied Psychology, Journal of Management, and Journal of Business and Psychology. Jonathan Passmore (Series Editor) is Professor of Psychology at the University of Evora, Portugal, and Managing Director of Embrion, a psychology consulting company working across Europe and the Middle East. He is a chartered psychologist, holds five degrees, and has an international reputation for his work in coaching and leadership. He has published widely books on the themes of leadership, personal development and change, and served as editor for the Association for Coaching book series. He speaks widely at conferences across the world and has published over 100 journal papers and book chapters. Nuno Rebelo dos Santos is Professor of Psychology at the University of Evora, Portugal, and is the Director of the PhD program in Coaching. He has been a faculty member for several PhD and master courses, including the Erasmus Mundus Master Program in Work, Organizational and Personnel Psychology and the Erasmus Mundus Intensive Program in Human Resources and Knowledge Management in Health and Social Care. He has worked for more than 20 years in executive training and development and his research focuses on performance development and cooperation in organizations. Sigmar Malvezzi is Professor and Researcher of Fundação Dom Cabral, Brazil. He received his PhD at the Department of Organizational Behavior at the University of Lancaster, UK, and the degree of “Livre Docente” at the University of São Paulo, Brazil. He has lectured at the Institute of Psychology of the University of São Paulo and at the Business School of Fundação Getulio Vargas. His research has explored professional and career development with focus on the building of professional identity. His most recent book is Gramáticas Actuales de la Relación Hombre-Trabajo (2012).